It may seem normal: As we age, we misplace car keys, or can’t remember a name we just learned or a meal we just ordered. But University of Florida researchers say memory trouble doesn’t have to be inevitable, and they’ve found a drug therapy that could potentially reverse this type of memory decline. The drug can’t yet be used in humans, but the researchers are pursuing compounds that could someday help the population of aging adults who don’t have Alzheimer’s or other dementias but still have trouble remembering day-to-day items. Their findings will be published in today’s (March 5) issue of the Journal of Neuroscience. The kind of memory responsible for holding information in the mind for short periods of time is called “working memory.” Working memory relies on a balance of chemicals in the brain. The UF study shows this chemical balance tips in older adults, and working memory declines. The reason? It could be because their brains are producing too much of a chemical that slows neural activity. “Graduate student Cristina Banuelos’ work suggests that cells that normally provide the brake on neural activity are in overdrive in the aged prefrontal cortex,” said researcherJennifer Bizon, Ph.D., an associate professor in the department of neuroscience and a member of UF’s Evelyn F. & William L. McKnight Brain Institute. This chemical, an inhibitory brain neurotransmitter called GABA, is essential. Without it, brain cells can become too active, similar to what happens in the brains of people with schizophrenia and epilepsy. A normal level of GABA helps maintain the optimal levels of cell activation, said collaborator Barry Setlow, Ph.D., an associate professor in UF’s departments of psychiatry and neuroscience. 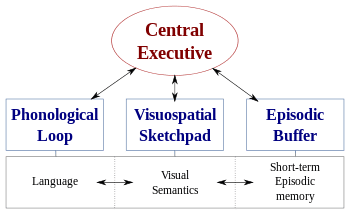 Working memory underlies many mental abilities and is sometimes referred to as the brain’s mental sketchpad, Bizon said. For example, Bizon said, you use your working memory in many everyday activities such as calculating your final bill at the end of dining at a restaurant. Most people can calculate a 15 percent tip and add it to the cost of their meal without pencil and paper. Central to this process is the ability to keep multiple pieces of information in mind for a short duration — such as remembering the cost of your dinner while calculating the amount needed for the tip. “Almost all higher cognitive processes depend on this fundamental operation,” Bizon said. To determine the culprit behind working memory decline, the researchers tested the memory of young and aged rats in a “Skinner box.” In the Skinner box, rats had to remember the location of a lever for short periods of up to 30 seconds. The scientists found that while both young and old rats could remember the location of the lever for brief periods of time, as those time periods lengthened, old rats had more difficulty remembering the location of the lever than young rats. But not all older rats did poorly on the memory test, just as not all older adults have memory problems. The study shows the older brains of some people or rats with no memory problems might compensate for the overactive inhibitory system — they are able to produce fewer GABA receptors and therefore bind less of the inhibitory chemical. Older rats with memory problems had more GABA receptors. The drug the researchers tested blocked GABA receptors, mimicking the lower number of those receptors that some older rats had naturally and restoring working memory in aged rats to the level of younger rats. April 17, 2019 - Community rallies around Chandler mom of 3 killed in I-10 crash AZCentralStacey Sullivan died Saturday after a crash on Interstate 10. Her three children and niece suffered serious injuries. April 17, 2019 - Lululemon is at records, and charts suggest another 10% gain CNBCLululemon just hit record highs for its second straight day, and Todd Gordon of TradingAnalysis.com sees more upside. April 17, 2019 - Phillies throttle Matz (and Mets) behind early offensive explosion NBCSports.comThe Phillies pounded Steven Matz in the first inning Tuesday night and never looked back in a dominant 14-3 win over the Mets. By Jim Salisbury. April 16, 2019 - American Idol Recap: Top 10 Revealed, Eliminations — Watch Performances TVLineAmerican Idol reveals the Top 10 finalists of Season 17. Read our recap, then weigh in with your reactions. April 17, 2019 - 10 years later: Oral history of how Eagles landed Jason Peters NBCSports.comTen years ago, the Eagles made a franchise-altering move when they traded for Jason Peters. Here's how it happened. By Dave Zangaro. April 17, 2019 - Top 10 bilingual books The GuardianFrom the ghostly remains of Sappho's ancient Greek, to Chimamanda Ngozi Adichie's untranslated Igbo – a selection of the best tales told in multiple languages.